Teaching about ethnic issues in China, one of the greatest challenges I encounter is getting learners to see citizens of the so-called “minority nationalities” as fellow human beings. In some cases, there is a tendency to view these peoples as one-dimensional depersonalized victims of the similarly impersonal idea of the “Chinese Communists.” And in other cases, students influenced by Chinese state propaganda see these peoples as archaic vestiges of earlier eras in human history, in need of rescue by the Maoist practice of “revolution” or its post-Maoist variant, “development.” My Tibetan Childhood: When Ice Shattered Stone transcends such simplistic portrayals by providing an unexpurgated look at life in Greater Tibet (outside of the Tibetan Autonomous Region) in the 1950s. Through the eyes of a child, with whom the reader comes to closely identify over the course of this beautifully translated narrative, we are able to begin to see the hopes, aspirations, betrayals, and violence of this era, whose effects continue to be felt to this day. Having seen these unthinkable sights through a nine-year-old’s eyes, reading My Tibetan Childhood becomes a process of hoping that all might end differently, while knowing that it will not. Following the prelude, “Born on the Wide Tibetan Grasslands” takes readers back to 1949 to witness the birth of the author in Eastern Tibet. The author’s Naktsang family is described as prosperous and flourishing, while their home village of Madey Chaguma in Amdo is described as a vibrant grassland adjacent to the Machu River. Born on a stormy night, baby Nukho’s family finds that he simply will not stop crying, which they perceive as a portent of a sad and difficult life. Indeed, the family’s fortune changes quickly and radically. Nukho’s mother dies when he is only a few years old, ushering in a series of calamities that befall the family: their horses are stolen; they encounter unforgiving robbers; and Nukho’s grandfather and uncle die, leaving only Nukho, his father, and his brother Japey. His father roams to earn a living, while the two boys are supported by the local monastery. 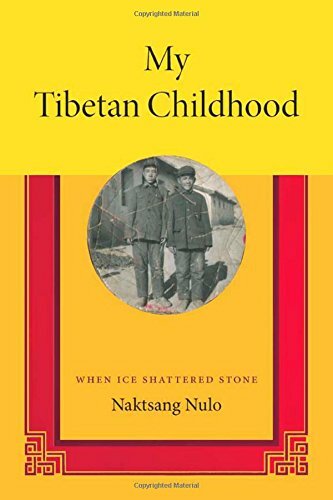 In the following two sections, entitled “A Childhood with Herdsmen, Bandits, and Monks” and “By Yak Caravan to the Holy City of Lhasa,” readers witness Nukho’s daily life in eastern Tibet in the 1950s, while also joining him and his family on a pilgrimage to Lhasa. Reading Karl Ove Knaussgard’s best-selling autobiographical My Struggle series alongside My Tibetan Childhood, I was immediately struck by the similarity in literary styles across sweeping cultural and geographical divides. Both open windows onto the details of their protagonists’ daily lives. In My Tibetan Childhood, we see Nukho playing with friends, raising a pet pika with his brother, and encountering mad dogs and horse thieves. Everyday life in Tibet in the 1950s is brought to life vividly in these brief vignettes, a rare accomplishment. Readers soon follow Nukho on a pilgrimage with his father and brother to Lhasa at the age of six to commemorate those in his family who had died in the previous years. The journey from Amdo to Lhasa, which the narrator describes as “a very strange, frightening, difficult journey” (97), is rich with suspense and lively details: the countryside is full of bandits, unpredictable weather, and wild animals. In one section of this chapter, the group meets a mother bear with her cub, only to discover that the intimidating bear is in fact blind: leaving some cheese behind for her and her cub, the narrator realizes that, despite the donation, they will inevitably die. In another section, they encounter a mother who fought to the death to protect her one-year-old baby from a pack of voracious wolves: the baby is rescued and taken to a monastery to be raised, to the relief of the mother, as she breathes her last dying breaths. After this long journey, arriving in Lhasa, the family visits one monastery a day, has an audience with the Dalai Lama, and celebrates Losar (Tibetan new year) in this historic city. In “Witness to Massacre on Our Tragic Journey through Desolate Places,” readers follow Nukho and his family on a second and even more challenging journey to Lhasa during the “time of revolution.” In the process labeled in official-speak “social reform,” which was initiated in Tibetan areas in 1958, promises of autonomy and non-interference are followed by violence, the forced destruction of the local monastery, and the arbitrary detention of monks and laypeople. Concern about the future and a desire for his children to receive a monastic education leads Nukho’s father to guide his sons on a second journey to Lhasa: this time not to remember the dead, but to escape death. As the narrator says, “the only way to escape was to leave my native land and wander far away” (150). The journey is long, and the desired escape is painfully and perpetually deferred. Hoping to avoid interactions with the Chinese army, the family and their fellow travelers find one chiefdom after another destroyed: monasteries ransacked, villages slaughtered, and groups of pilgrims massacred. An air of inescapable terror characterizes this section of the narrative, and finally catches up with Nukho and his family in a dramatic gun battle that leaves his father dead and the survivors in Chinese custody. As he watches vultures tear apart his father’s body, the narrator comments: “there was nowhere left to escape to” (181). The boys are released after eighteen days in the hole to attend a nearby school. Known as the “Joyful Home,” the two young inhabitants are at first impressed with the abundance of food and are truly joyful, despite other students’ “revolutionary” criticisms of their religious “superstition.” Yet as 1959 arrives, food shortages first foreshadowed in the underground prison gradually extend outward to this Joyful Home. The remainder of the book provides a harrowing portrayal of life in Tibet during the Great Leap Forward famine: children eating leather, consuming rodents, and using their last ounces of energy to drag their deceased companions out of their tents. Two images from this section of the book are particularly evocative: the first is dead children with their pillows covered in oily vomit, deceased after gorging themselves on stolen dog fat, while the second is living children, standing by a river, chewing raw human flesh off of a leg, distracted only by the promise of the narrator’s pika meat. When the narrator and his brother leave Joyful Home to return home with their adult companions, only 63 out of over 1,600 Joyful Home residents had survived the famine. Needless to say, this is a stark figure: the end of the narrative arrives at its destination, as this reader knew it inevitably would. Yet as Robert Barnett points out in his thoughtful introduction, there is no explicit political commentary to be found in My Tibetan Childhood. The language throughout the book is simple and straightforward, stripped of any extraneous commentary or critique. Rather, the narrative is a collection of unforgettable details, and these details, in my reading, truly speak for themselves. This book is a rare opportunity to view everyday life in Tibet in the 1950s, and for this reason would make an outstanding addition to courses on modern Tibetan history, ethnic relations in the PRC, or the anthropology of political violence. Yet even more importantly, My Tibetan Childhood provides a chance to see and understand modern Tibet’s path through Tibetan eyes. At a time of increasing polarization, mistrust, and violence, few matters could be more pressing.